A kitchen is a brighter, much more pleasant place to cook in when its countertops are illuminated with under-cabinet lighting. Under-cabinet lighting gives a sparkling decorative effect and gives you top-notch task lighting. Under cabinet lighting brings an unobstructed light to work surfaces as opposed to light coming from behind, which creates shadows. Under cabinet lighting is a great way to add distinction and class to any kitchen or work area. Under Cabinet Lighting offers shadow-free lighting for the kitchen and work areas. The use of Task Lighting, Disk Lighting or Ambiance Low Voltage Linear Lighting is a great way to show off all of your prized possessions. Every residential architect knows that all home designs require a carefully planned kitchen, and every kitchen will require cabinets with lights. Countertop areas underneath display cabinets are extremely important. They serve both a decorative as well as practical purpose. Shadows underneath cabinets are both unattractive, and they can also make working with knives and other kitchen implements unsafe. Cabinet lighting strips are currently much smaller than the generic types of fixtures available. They are easy to hide beneath the forward under the surface of even the most ornate and customized cabinetry. Glare shields in the linear strips direct the light backward away from the eyes. This minimizes glare and creates a more even distribution of light under the cabinet. Dimmer controls allow you to make further adjustments, fine-tuning illumination over countertops to match that of overall lighting in the room. This makes for superior aesthetic qualities and much more comfortable environment for food preparation, parties, and other special hosted gatherings. As lighting technology advances, more choices become available to enhance the beauty and energy efficiency of homes. 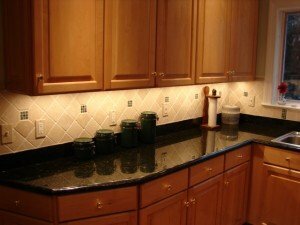 Undercabinet lighting comes in many different forms, shapes, and sizes, the most common lights used for under cabinet lighting are fluorescent strip lights, LED lighting and 12-volt downlights. 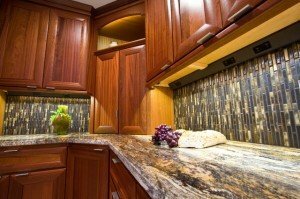 Fluorescent LED and 12volt lighting systems both have their advantages and disadvantages when installing under cabinet lighting. Under cabinet lighting can be installed in most kitchens without major renovation works and will also depend on various plan layouts, our Vancouver electricians have experience installing a range of under cabinet light fixtures.